In the U.S., Santa Claus comes every December 24th from the North Pole, to bring presents for the good children and coal for those that have been naughty. In the Netherlands, the tradition is slightly different. The gift bringer is known as Saint Nicholas. And he comes every December 5th from Spain, accompanied by his Moorish assistant Black Peter. For the good children, Saint Nicholas brings presents. For the naughty ones, Black Peter puts them in a sack to be brought with him back to Spain. The concept of a Christmas-time gift bringer is universal throughout Europe. But the form the gift bringer takes varies quite a bit from country to country, ranging from La Befana, Italy’s gift-giving witch, to the 13 Yule Lads of Iceland. 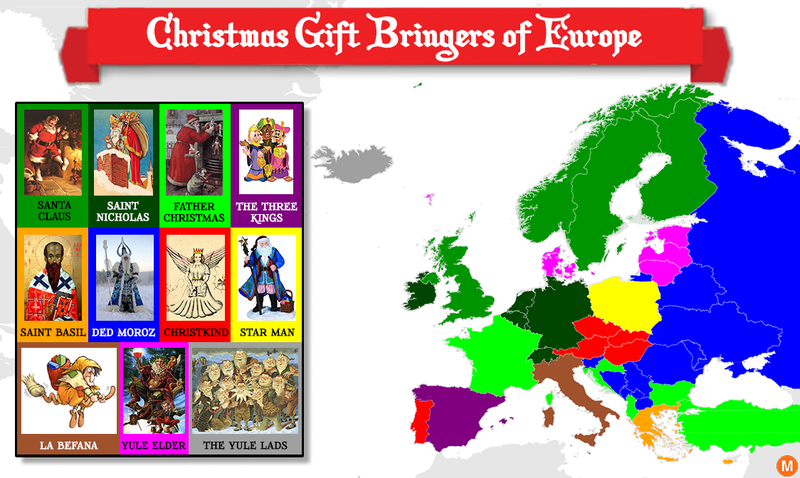 The first map below shows who brings the Christmas gifts in each country in Europe. In many cases, the Christmas gift bringer is not alone. Often he is accompanied by an alter ego, who typically represents a darker, scarier side of Christmas. In France, Father Christmas is joined by Whipfather, whose role is to beat the unfortunate children who have misbehaved. 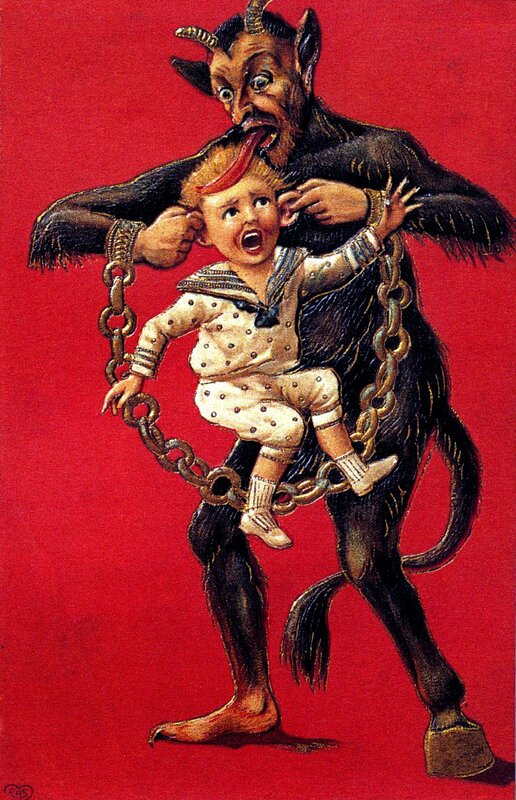 In Austria, the naughty children are punished by Krampus, the terrifying Christmas demon. 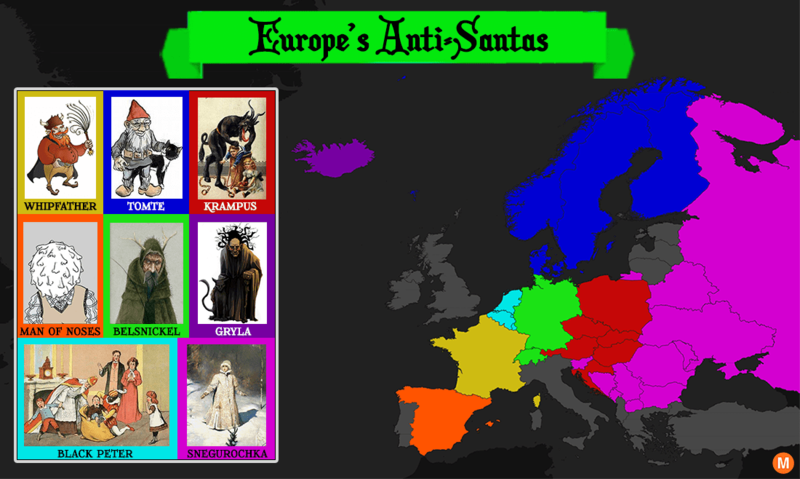 These “anti-Santas” of Europe are shown in the second map below. Who brings the Christmas presents in each country in Europe? In most cases, the gift bringer take the form of an old, white-bearded man, similar in form to Santa Claus. Though the different characters originate from a range of historical traditions. In the most religious form, it is Saint Nicholas, a real 3rd century saint, who brings the gifts. And he delivers them not on Christmas eve, but on December 5th, the eve of Saint Nicholas day. In contrast, the Santa Claus of the Scandinavian countries is rooted in the ancient Norse God Odin. Ded Moroz, who also takes on a similar appearance, was promoted by the Communist-era Soviets as a secular alternative to Saint Nicholas. He delivers the presents on the evening of January 6th, the Orthodox calendar’s Christmas Eve. In the U.S., children are encouraged to behave well by the prospect of Santa bringing them a lump of coal. In Europe, the penalties for misbehaving children can be far more terrifying. 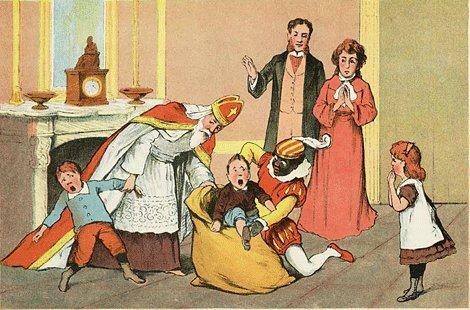 As mentioned above, in Belgium and the Netherlands, Saint Nicholas is joined by Black Peter, whose job is to stuff the naughty children into a sack to be carried off to Spain. In France and Germany, Father Christmas / Saint Nicholas are accompanied by their sadistic alter-egos Whipfather / Belsnickel, who are said to carry whips / sticks for beating children who have misbehaved. Most terrifying of all, Austria’s Christmas-demon Krampus punishes the naughty children by dragging them down to hell. And Iceland’s evil ogress Gryla seeks out misbehaving children to satisfy her insatiable appetite. However, not all of Europe’s “anti-Santas” are quite so evil. In the old Soviet block countries, the Communist Santa, Ded Moroz, is accompanied by his beautiful and kind granddaughter Snegurochka, the Snow Maiden. And in the north of Spain, the children are taught of the Man of Noses, who grows a new nose on his face each day of the year. However, he only leaves his home on January 1st, the only day of the year when he has a single nose, which makes him difficult to identify. My latest project, Elementus, aims to bring transparency to the cryptocurrency market. Check out our blog for some crypto-related data visualizations. I'm an NYC-based entrepreneur (my newest project: Blueshift) and adjunct instructor at UPenn. I'm fascinated by data visualization and the ways that data is transforming our understanding of the world. I spend a lot of time with my face buried in Excel, and when I find something interesting I write about it here and also as a Guardian Cities and Huffington Post contributor. Hello, also in Italy the man red dressed that give Christmas gift is named “Babbo Natale” (could sound like Father Christmas). You have cited the “Befana” that is a female figure that give “poor” gift (Befana is said to be poor) on 6th January, not on 25 December. We actually have Santa Claus in Ireland! Hi. I live in Poland and I don’t have any idea what neither Star Man nor Krampus mean. We simply have Santa Claus (Saint NIcolas), who gives presents to polite children and a twig to bad ones (it is worth mentioning that Santa doesn’t whip the children, he simply offers the twig as a warning. In the comunist era the propaganda tried to replace Santa with Grandfather Frost (imported from the Soviets) but it has never really caught on. Best regards.